The question was asked, how does Cricket’s Song and A Bard Without a Star relate to each other? Is Bard a sequel to Song? Well, it’s more like prequel. Bard takes place about 200 years before Cricket is born. Gwydion is one of the three great bards that Cricket learns about, the other two being Amergin (who defeats the evil bard Cathbar), and Taliesin (who founds the bardic order). I intend to write the stories of all three. 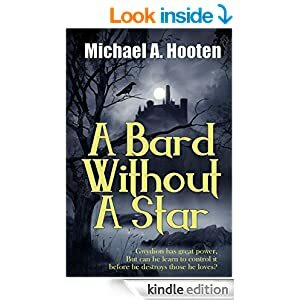 Plus a true sequel to Cricket’s Song, and the stories of some of the kings (King Arthur and Brian Boru), and some of the heroes (CuChulainn and Finn MacCumhal). And who knows what else. Since I’m basing a lot of my world on Irish and Welsh mythology, there’s lots of material for both inspiration and modification. I know some will not like the liberties I take with some stories, and I apologize. But Glencairck is not Ireland or Wales, and I did that because I’m not doing a straight retelling. I am forging my own history, my own world, and my own characters. I may use some other mythological characters as a basis, but it is generally just a starting point, and a shorthand for some traits for those that recognize the material. But then they tend to go running off in directions that I didn’t even know existed, and so I follow along and take notes. The stories are there, and now I have to give them shape and form. And that takes a while.